Dylan Thomas, a linebacker at a Georgia high school, lost feeling in his left arm and leg after being tackled by his opponent on the field. Although Thomas insisted he would continue playing after a brief rest, the situation turned out to be a lot worse than he imagined. Seven minutes after the tackle, he was rushed to the hospital and put through forty hours of surgery, but nothing worked. Dylan Thomas died, 16-years-old, in September 2018, two days after participating in a football game. The cause of death: cardiac arrest caused by an unseen head injury during the game. Thomas’s story isn’t the only example of the dangers in high school football. These student athletes are at frequent risk of receiving concussions, breaking bones, or suffering heat strokes. According to the Institute of Medicine, 1 in 14 players risks getting a concussion while playing football, a rate that’s 60% higher than other sports. Some of the institute’s findings also indicate that football players risk more life-threatening injuries than any other high school sport. This raises the obvious question: Should we ban high school football? Although the possibility of injury is high, many players and fans are still unconvinced that banning football in high schools is the correct choice. These effects are temporary. Repeated concussions, however, may leave long-term effects such as cognitive and mood disturbances, difficulty thinking, and chronic traumatic encephalopathy (CTE) -- an injury currently affecting many former NFL players, according to a study done by the Boston University School of Medicine. CTE hinders one’s ability to do everyday activities and can cause violent mood swings and lead to suicide. 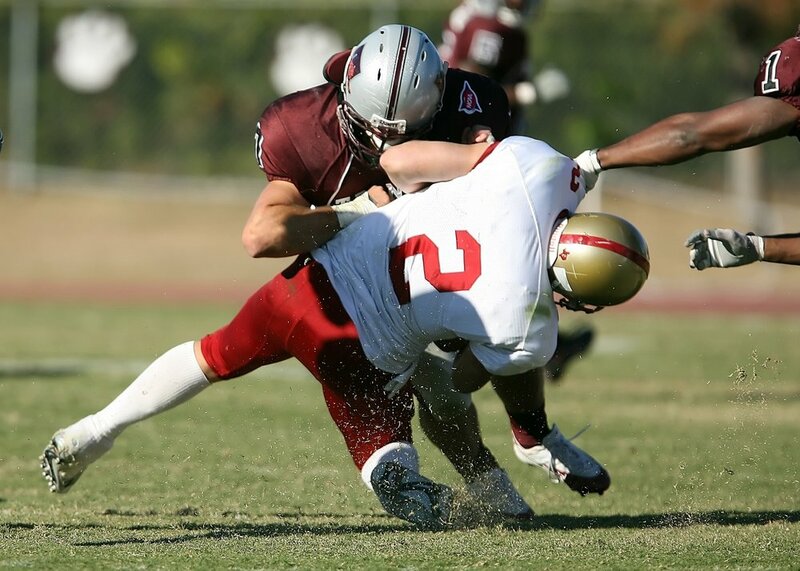 In addition to concussions, football players risk other serious injuries. In November 2018, during a game at a Mississippi high school, 17-year-old Jeremiah Williams was tackled and broke two vertebrae. After a week in the hospital, Williams died. To prevent such tragedies in the future, it’s important to consider banning football in high schools. By banning the sport, we might prevent more tragedies like the concussion suffered by Thomas or the neck injury suffered by Williams. Although football has a strong community behind it, it’s also important to recognize how the sport is putting young lives in danger.